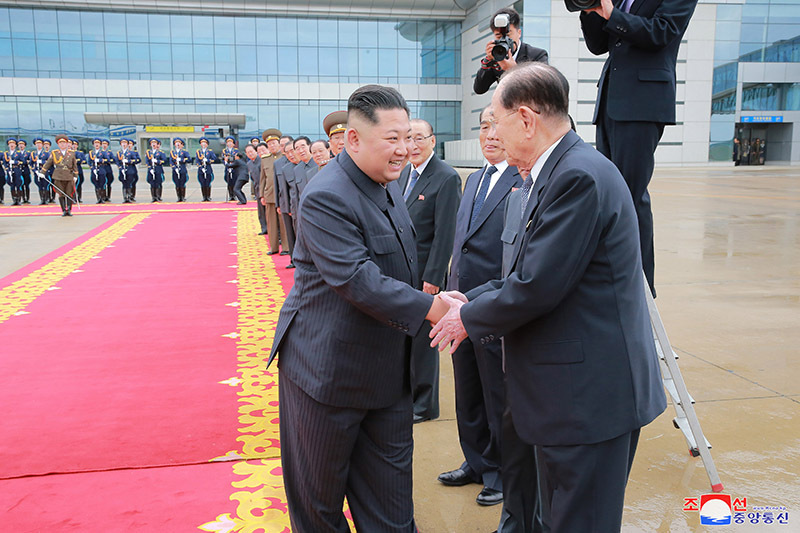 Kim Jong Un shakes hands with DPRK Premier, State Affairs Commission Vice Chairman and WPK Political Bureau Presidium Member Pak Pong Ju at Pyongyang International Airport on June 10, 2018. Also visible in this image are (L-R) VMar Ri Myong Su, Yang Hyong Sop, Choe Ryong Hae and Kim Yong Nam (Photo: KCNA). 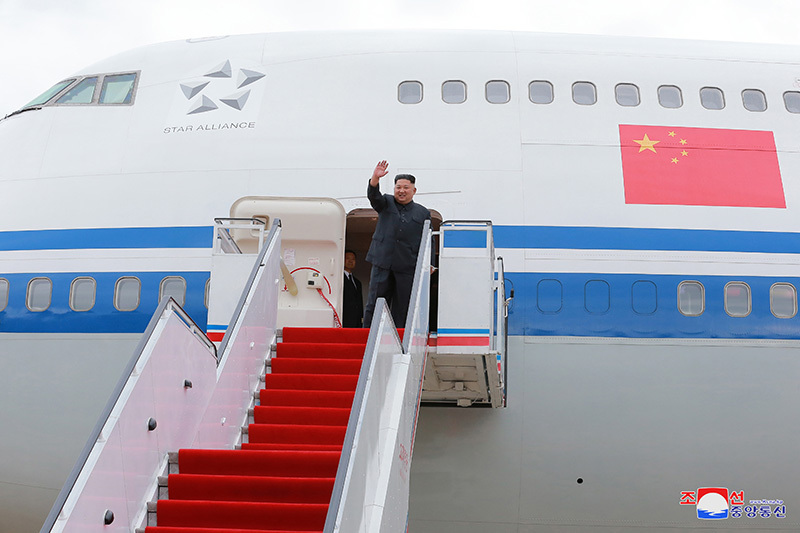 Kim Jong Un (Kim Cho’ng-u’n) departed on an Air China passenger plane for Singapore on the morning of June 10 (Sunday) for “the historic first summit meeting and talks” with Donald J. Trump, President of the United States. 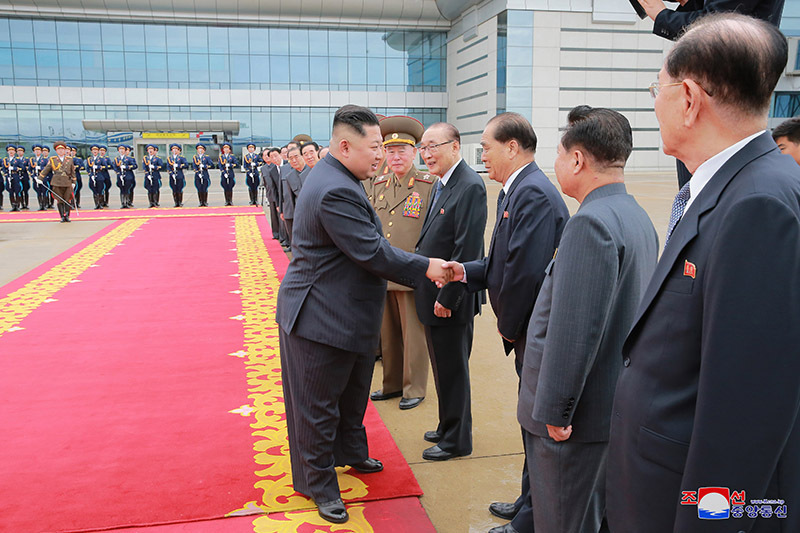 Kim Jong Un shakes hands with Supreme People’s Assembly Presidium President and WPK Political Bureau Presidium Member Kim Yong Nam at Pyongyang International Airport in Sunan-kuyo’k, Pyongyang, on June 10, 2018 (Photo: KCNA). 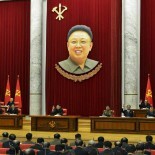 A ceremony was held at Pyongyang Airport prior to Jong Un’s departure. He was seen off at the airport by Supreme People’s Assembly [SPA] Presidium President Kim Yong Nam (Kim Yo’ng-nam), Workers’ Party of Korea [WPK] Vice Chairman and WPK Organization Guidance Department Director and State Affairs Commission Vice Chairman Choe Ryong Hae (Ch’oe Ryong-hae), DPRK Premier and State Affairs Commission Vice Chairman Pak Pong Ju (Pak Pong-u), SPA Presidium Vice President and Democratic Front for the Reunification of the Fatherland Presidium Member Yang Hyong Sop (Yang Hyo’ng-sop), WPK Political Bureau Member and the last known Chief of the Korean People’s Army [KPA] General Staff Department VMar Ri Myong Su (Ri Myo’ng-su), KPA General Political Bureau Director Gen. Kim Su Gil (Kim Su-kil), last known Director of the KPA General Staff Department Operations Bureau and 1st Vice Chief of the KPA General Staff Gen. Ri Yong Gil (Ri Yo’ng-kil), WPK Vice Chairman and WPK Propaganda and Agitation Department Director Pak Kwang Ho (Pak Kwang-ho), WPK Vice Chairman and WPK Cadres’ Affairs Department Director Kim Phyong Hae (Kim P’yo’ng-hae), WPK Vice Chairman and WPK Light Industry Department Director An Jong Su (An Cho’ng-su), WPK Vice Chairman for Science and Education Pak Thae Song (Pak T’ae-so’ng), Minister of People’s Security Gen. Choe Pu Il (Ch’oe Pu-il), DPRK Vice Premier and State Planning Commission Chairman Ro Tu Chol (Ro Tu-ch’o’l), WPK Vice Chairman for Workers’ and Social Organizations and State Physical Culture and Sports Guidance Commission Choe Hwi (Ch’oe Hwi) and WPK Vice Chairman for General Affairs Pak Thae Dok (Pak T’ae-dok). Members Kim Jong Un’s travel party included WPK Vice Chairman and WPK United Front Department Director Kim Yong Chol (Kim Yo’ng-ch’o’l), WPK Vice Chairman and WPK International Affairs Department Director Ri Su Yong (Ri Su-yo’ng; a/k/a Ri Chol), DPRK Foreign Minister Ri Yong Ho (Ri Yo’ng-ho), Minister of the People’s Armed Forces Gen. No Kwang Chol (No Kwang-ch’o’l), Personal Secretariat Deputy Director and WPK Propaganda and Agitation Department Senior Deputy Director Kim Yo Jong (Kim Yo’-cho’ng), DPRK Vice Foreign Minister Choe Son Hui (Ch’oe So’n-hu’i), Personal Secretariat Chief Kim Chang Son (Kim Ch’ang-son) and the Director of the Main Office of Adjutants. Kim Jong Un waves to the participants at a send-off ceremony held at Pyongyang International Airport in Sunan-kuyo’k, Pyongyang on June 10, 2018 (Photo: KCNA/KNS). 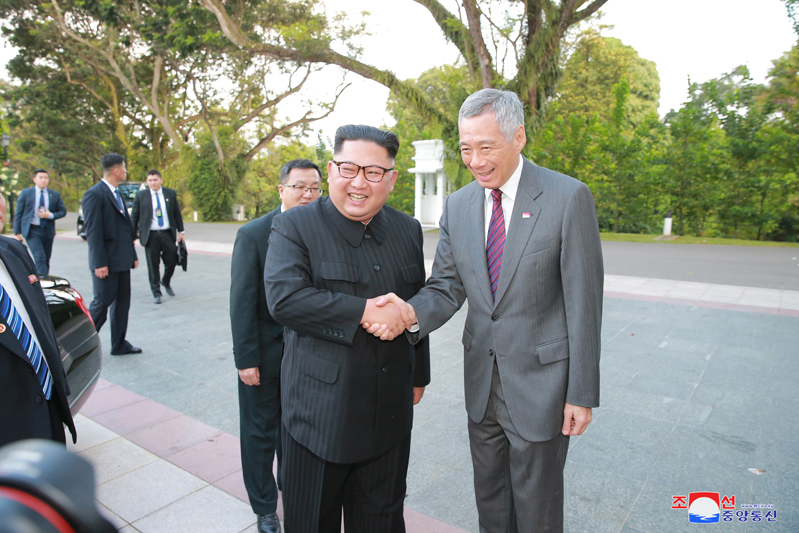 Kim Jong Un shakes hands with Singaporean Prime Minister Lee Hsien Loong at the Presidential Palace in Singapore on June 10, 2018 (Photo: KCNA). 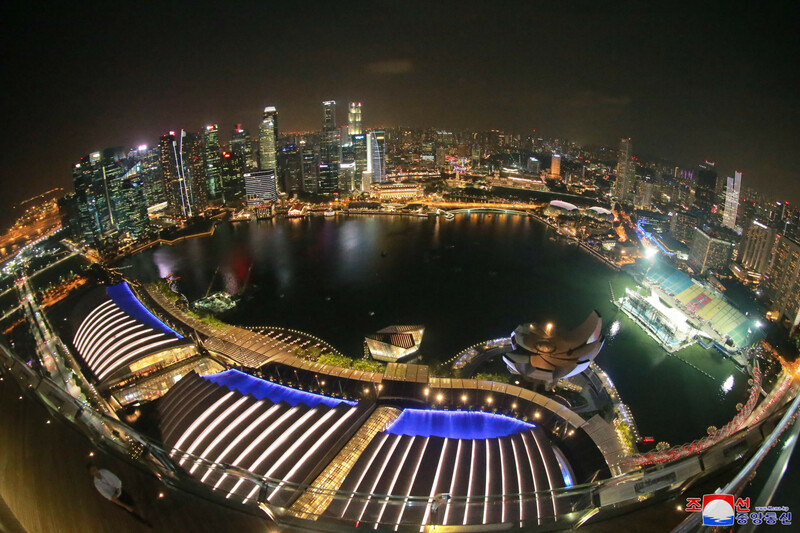 Not long after arriving in Singapore and freshening up in his hotel suite at the St. Regis, Jong Un met with Singaporean Prime Minister Lee Hsien Loong. Also in attendance were Kim Yo Jong, WPK Vice Chairman and UFD Director Kim Yong Chol, WPK Vice Chairman and IAD Director and Minister of the PAF Gen. No Kwang Chol. Attending from the Singaporean Government were Foreign Minister Vivian Balakrishnan, Education Minister Ong Ye Kung, Senior Minister of State for Foreign Affairs and Defense Maliki Bin Osman and Senior Minister of State at the Ministries of Culture, Community and Youth and Trade and Industry Sim Ann. 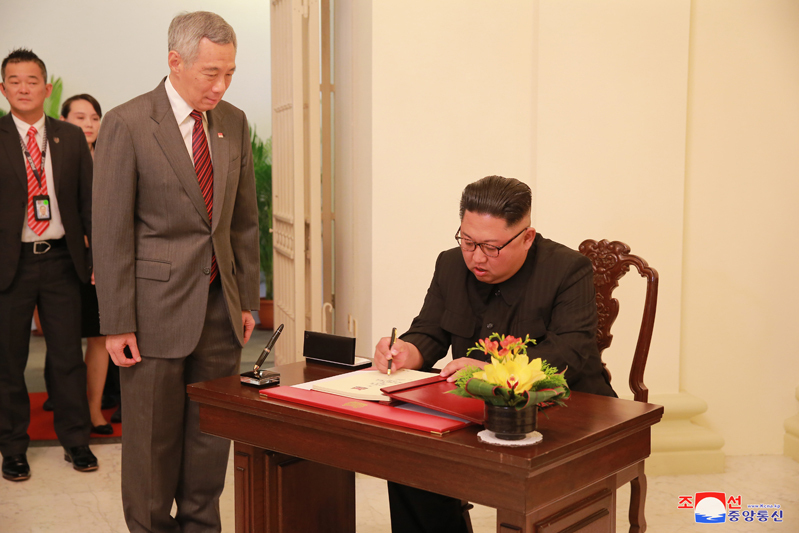 Kim Jong Un signs the visitors’ book while Singaporean Prime Minister Lee Hsien Loong (left) looks on. 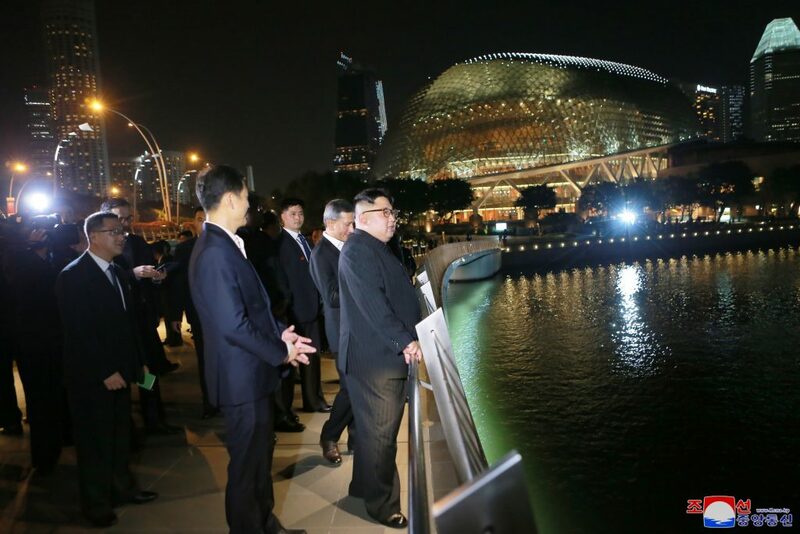 Also visible in the background is Kim Yo Jong (Photo: KCNA). 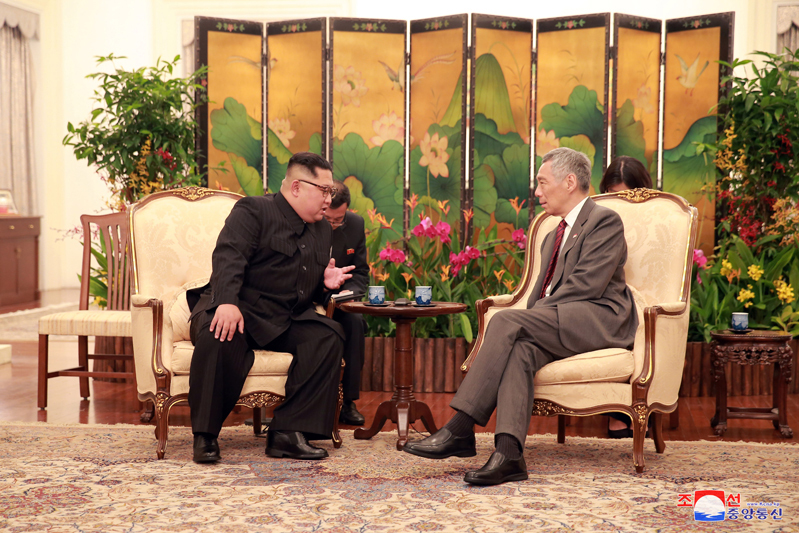 Kim Jong Un talks with Singaporean Prime Minister Lee Hsien Loong on June 10. 2018 (Photo: KCNA). 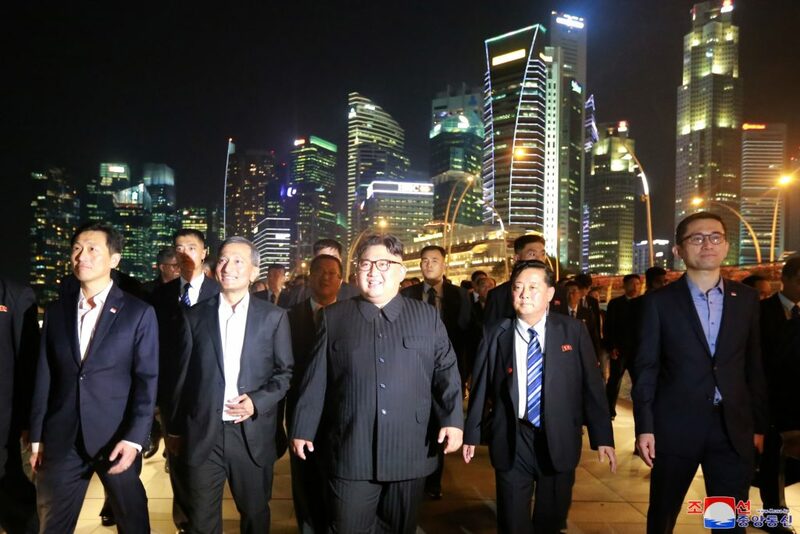 Kim Jong Un on his evening walk through Singapore on June 11, 2018 (Photo: KNS/Rodong Sinmun). 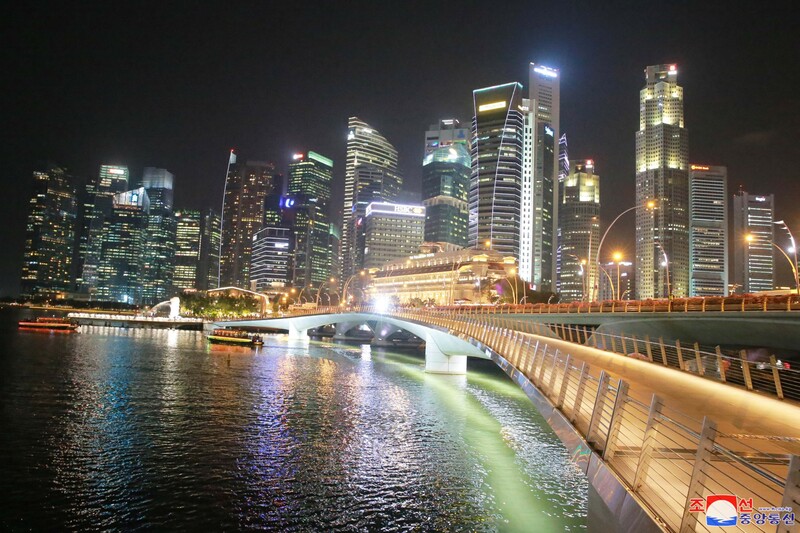 Kim Jong Un walks through Singapore during the evening of June 11, 2018. 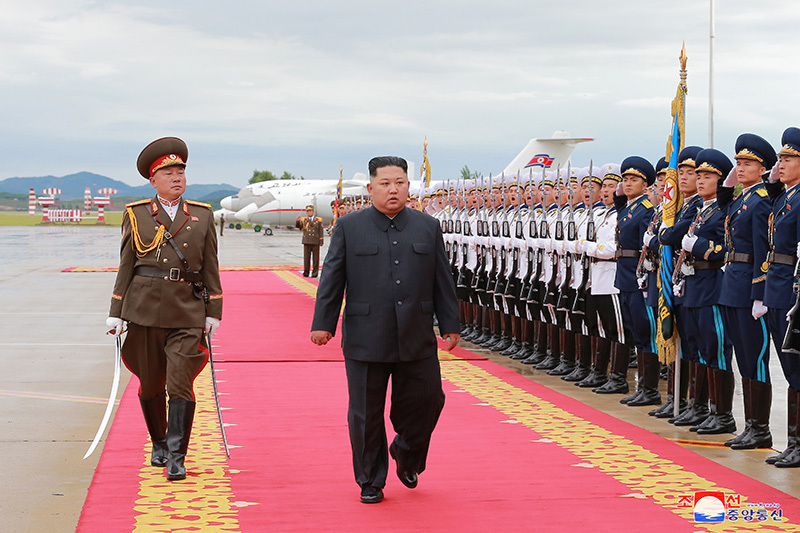 Also in attendance on the right of KJU is his lead bodyguard and the Director of the Main Office of Adjutants (Photo: KCNA/KNS). This article was written on 13 Jun 2018, and is filled under 2018 DPRK-US interactions, 2018 Strategic Rhetoric, American Affairs Bureau, An Jong Su (WPK LID), Cadre Affairs, Central Committee, Central Military Committee, Central Party Affairs/Cadres 5th Section, Choe Hwi (PAD], Choe Ryong Hae, Choe Son Hui (FA), Civil Defense Department, Col. Gen. No Kwang Chol (KPAGS), colonel general, Committee for the Peaceful Reunification of Korea, Committee for the Peaceful Reunification of the Fatherland (CPRF), DPRK Cabinet, DPRK Diplomat Corps, DPRK External Relations, DPRK Intelligence Community, DPRK Premier, DPRK-Singapore Relations, DPRK-US Relations, Events Management Section, Executive Policy Bureau, Finance and Accounting, Gen. Choe Pu Il, Gen. Kim Yong Chol, Gen. Ri Myong Su, Gen. Ri Yong Gil, General Affairs, gsd, gsob, Guard Command, III Army Corps, Information Section, Inspections (PAD), internal security, International Affairs Department WPK, International Department, Kim Chang Son, Kim Chong-un inspections, Kim Family, Kim Jong Un Visits, Kim Jong-un, Kim Phyong Hae (Cadres/NPYPPC), Kim Yo Jong, Kim Yo-chong, Kim Yong Nam, KJI Personal Secretariat, KJI-Ko Yong Hui Family, Korean People's Army Supreme Command, Korean People's Internal Security Forces, Korean People's Army (KPA), Korean Workers' Party (KWP), KPA General Political Bureau, KPA General Political Department, KPA General Staff, KPA supernumerary organizations, KPA WPK Committee, kpif, Lt. Gen. Kim Su Gil, Military Affairs, military security command [msc], Ministry of Foreign Affairs, ministry of people's security, Ministry of State Security, Ministry of the People's Armed Forces (MPAF), MPAF GPB, North Korean press, Notification, Organization and Guidance Department, Pak Kwang Ho (PAD), Pak Pong Ju, Pak Tae Dok (N. Hwanghae WPK), Pak Thae Song (KWP CC Dept), Party elders, party life, Party Life Guidance, Political Bureau, population control, Propaganda and Agitation Department, Public Events, Public Information Commission, Publication Guidance Bureau, Pyongyang Defense Command, reserve training units, Ri Chol, Ri Su Yong, Ri Yong Ho (FA), Ro Tu Chol, Secretariat, social control, State Affairs Commission, State Planning Commission (SPC), State Security Department, Supreme People's Assembly, Third Floor, United Front Department, Worker Peasant Red Guard, Workers' and Social Organizations, Yang Hyong Sop.